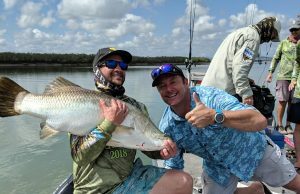 Chasing mackerel in Townsville on big surface poppers! Mackerel fishing – it’s addictive. Anyone who has chased these super pelagics will know the feeling of hooking one is just next level. They’re quick, agile and aggressive, making for a fight that will leave you buggered! How about adding more excitement to that mix… by catching them on BIG surface poppers! There are many on the market, but Scotty loves his Halco Rooster poppers. They have a big cupped face on them, meaning as you work them back to the boat, they create a big splash. This in turn should attract an aggressive response from any big mackerel lurking below. Let us tell you, the strikes on topwater are just incredible. Because of their speed, Mackerel will more often than not spear out of the water to hit these lures. Simply awesome. BCF is your first point of call for your next mackerel mission. They have all the slugs and poppers you could ever want, plus the tackle to help you lend the fish. Here’s a tip, many anglers use a piece of wire as leader due to the Mackerel’s razor sharp teeth. This prevents them slicing through conventional fluorocarbon leader. When you are next in Townsville, say g’day to the team at Oaks Metropole. 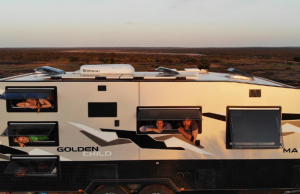 Their self-contained rooms are perfect for anyone looking to come to base themselves in Townsville for a fishing trip. It’s in the heart of town, nice and close to the harbor… what more could you want! Andrew Mead, friend of the show, all round good bloke, and super-talented fisherman. 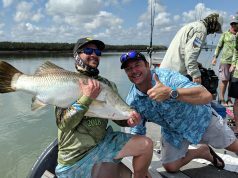 He runs Aussie Barra Charters, but despite the name, he grew up game fishing! He has a long list of trophy marlin to his name, and will look after any variety of fishing you want to try. Give him a call and tell him we sent you!